Own Little Princess Series 1 to 2 DVD from Deff, DVD, Blu-Ray & 4K Video Specialists - Free UK Delivery..
Little Princess deals with the everyday challenges that children and parents face together, conquering fears, confronting new situations and learning to accept that sometimes things don't quite go according to plan. The positive message delivered with each story is wrapped up in a warm blend of humour and surprise. Little Princess invites children and parents to join her in mischief making by royal appointment with 5 more fun episodes. ..
Little Princess is full of energy, charm and questions about how the world works. Like most children she is very curious and delightfully stubborn when things don't go her way! She is determined yet lovable and however demanding she gets no-one can stay angry with her for long. Join Little Princess and her friends for adventures at the castle. Featuring the voice talents of Jane Horrocks and Julian Clary, Little Princess invites all lit..
Little Princess is full of energy, charm and questions about how the world works. Like most children she is very curious and delightfully stubborn when things don't go her way! She is determined yet lovable and however demanding Little Princess gets no-one can stay angry with her for long. Join Little Princess and her friends in Let's be Good! Featuring the voice talents of Jane Horrocks and Julian Clary, Little Princess invites all lit..
Own Little Princess - I Didnt Do It DVD from Deff, DVD, Blu-Ray & 4K Video Specialists - Free UK Delivery..
Own Little Princess - I Dont Want To Go To Bed DVD from Deff, DVD, Blu-Ray & 4K Video Specialists - Free UK Delivery..
Own Little Princess - I Love Animals DVD from Deff, DVD, Blu-Ray & 4K Video Specialists - Free UK Delivery..
Join Little Princess and her friends for more adventures at the royal castle, with six favourite Little Princess episodes to keep your little ones happy! There's a lot to learn when you're a Little Princess and when princess opens a cafe with Algie as her waiter, in I Mustn't Be Bossy, she realises some things require lots of organisation. She soon finds out that Algie and her customers don't like being told what to do! It takes some pr..
Join Little Princess and her friends for more adventures at the royal castle. With six favourite Little Princess episodes to keep your little ones happy! Little Princess is always learning and has lots of find out in these fun-packed episodes. 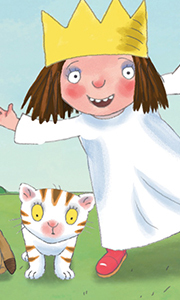 Whether it's match-making for Maid in I Want To Be A Bridesmaid or making amends in I Want Your Tiara, Little Princess has Scruff, Puss and King and Queen to help her make the right choices, event..
Join Little Princess and her friends for summertime adventures at the royal castle. With six favourite Little Princess episodes to keep your little ones happy! When Little Princess and the royal household visit the beach in I Want to Go to the Seaside, they learn that there's more to the seaside than ice-cream and donkey rides. When the sun finally comes out the games begin, with sand castle competitions, paddling, kite-flying and Puss ..
Join Little Princess and her friends for more adventures at the royal castle. With six favourite Little Princess episodes to keep your little ones happy! When Admiral gets the heave-ho from his pond by a flock of unfriendly geese in Please Don't Go, it's up to Little Princess to take his mind off it - by playing pirates! Shipmates Puss and Scruff join in the fun too - and soon the whole castle is walking the plank and singing shanties. ..
Little Princess is full of energy, charm and questions about how the world works. Like most children she is very curious and delightfully stubborn when things don't go her way! She is determined yet lovable and however demanding she gets no-one can stay angry with her for long. Join Little Princess and her friends in Let's Celebrate! This bumper edition features 12 episodes from Series 2. Featuring the voice talents of Jane Horrocks and..
Own Little Princess - Lets Play DVD from Deff, DVD, Blu-Ray & 4K Video Specialists - Free UK Delivery..
Everyone's favourite royal rascal is back to laugh and learn with her friends and family in the Kingdom. With her loyal pets Puss and Scruff, and trusty teddy Gilbert at her side. Little Princess's questions about how the world works are answered as she embarks on a series of wonderful adventures that will delight and inspire children as they learn with her. Featuring the voice talents of Jane Horrocks (Little Princess) and Julian Clary..
Little Princess has a unique personality combining both imagination and determination. The BAFTA nominated Princess encourages girls and boys to enjoy the rough and tumble of her world, be inspired by her adventures, learn new things, make mistakes and bounce back. Join Little Princess in her castle grounds for 5 more fun packed, mischievous adventures with her beloved family, and friends including Puss, Scruff and teddy Gilbert. 5 Fun ..
Join Little Princess and her friends for 5 new adventures at the royal castle! Every little person dreams about what they want to be when they grow up, and Little Princess is just the same. Whether she’s a super sleuth in I Want To Be A Detective, helping animals in I Want To Be A Vet or an astronaut blasting off in I Want To Go To Space, Little Princess is determined to think big. Sometimes things don’t go according to plan, but Little..
Everyone's favourite royal rascal is back to laugh and learn with her friends and family in The Kingdom. With her loyal pets Puss and Scruff, and trusty teddy Gilbert at her side, Little Princess's questions about how the world works are answered as she embarks on a series of wonderful adventures that will delight and inspire children as they learn with her. Featuring all 30 episodes from series one and with the voice talents of Jane Ho..
Everyone's favourite royal rascal is back to laugh and learn with her friends and family in The Kingdom. With her loyal pets Puss and Scruff, and trusty teddy Gilbert at her side, Little Princess's questions about how the world works are answered as she embarks on a series of wonderful adventures that will delight and inspire children as they learn with her. Featuring 34 episodes from series two and with the voice talents of Jane Horroc..
Own Little Princess Series 3 DVD from Deff, DVD, Blu-Ray & 4K Video Specialists - Free UK Delivery..